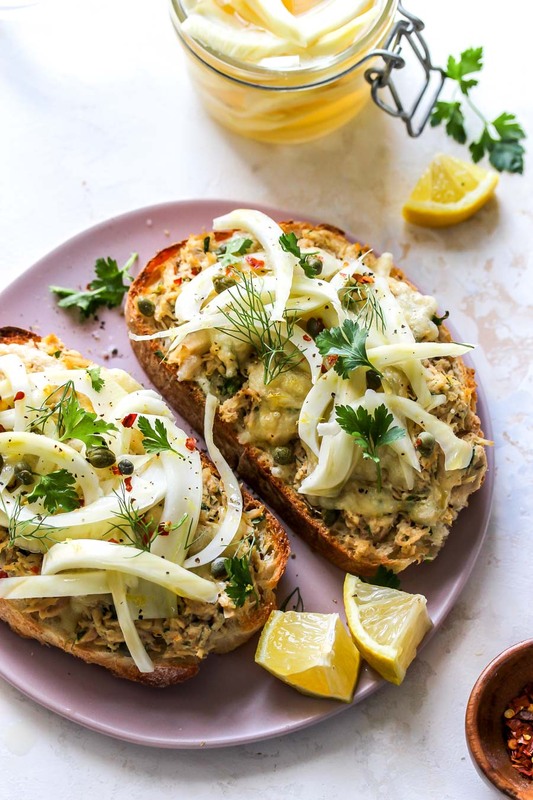 Tuna melts with quick-pickled fennel is an elevated version of the diner classic, bringing bright herbaceous flavors to the forefront. Enjoy as an easy, make-ahead lunch or weeknight dinner. It seems like folks have strong opinions on what consummates a stellar tuna melt. And then some would argue that a stellar tuna melt simply does not exist because tuna should never—not under any circumstances—be consumed warm. I disagree, and happen to love everything about them: the crusty, toasted bread, umami-laden tuna salad, melty cheese, and whatever fresh toppers are in the equation. They’re nostalgic, comforting, and ultimately fail-proof. We’ve elevated the classic here with quick-pickled fennel, lots of fresh herbs, and punchy lemon. The fennel adds welcomed dimension and crunch as a topper, plus some licorice notes to cut through the creaminess of the tuna salad and cheese. Canned tuna sometimes gets a bad rap because of concerns over mercury, but there are easy ways to keep it in check. Mercury biomagnifies the higher up in the food chain we go, so larger fish often contain higher amounts. For lower mercury levels, opt for smaller tuna fish—like light or skipjack tuna—over larger fish, like albacore and yellowfin. Now let’s talk nutritional perks of canned tuna, which, in my opinion, far outweigh the mercury concerns. It’s high in protein and a great source of heart-healthy omega-3 fatty acids DHA and EPA. These fats are essential, meaning our bodies can’t make them and, therefore, we must get them from our diet. The American Heart Association recommends we eat two (3- to 5-oz.) seafood servings every week to help reach our daily recommend dose of omega-3s, however only 1 out of every 10 Americans actually meets that quota. Beyond heart health, research also suggests that omega-3s support brain, eye, skin, and hair health as well. When purchasing canned tuna, look for the words “pole-and-line caught” on the label for the more sustainably-caught fish. My personal favorite is Wild Planet brand, which you can find at most well-stocked supermarkets. Both the tuna salad and pickled fennel can be made ahead, so all you’ll need to do is assemble, broil, and devour when lunch or dinner time rolls around. And beyond an open-faced melt, you could also enjoy the tuna salad and fennel on top of a bed of sturdy greens or wrapped in a whole-grain tortilla. 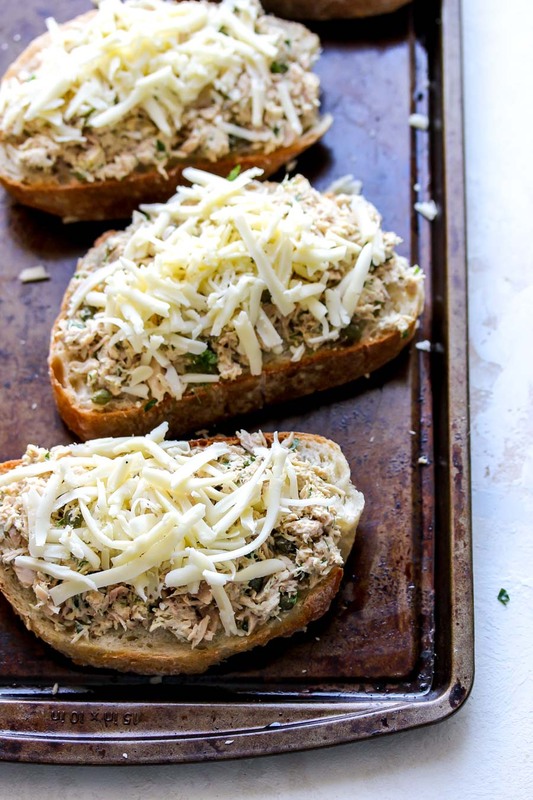 Crunchy, bright, and hearty in all the right places, these tuna melts should definitely earn a spot in your weekly meal rotation. If you give this a recipe a try, be sure to tag #dishingouthealth on Instagram so I can see your beautiful creations! Cheers, friends. 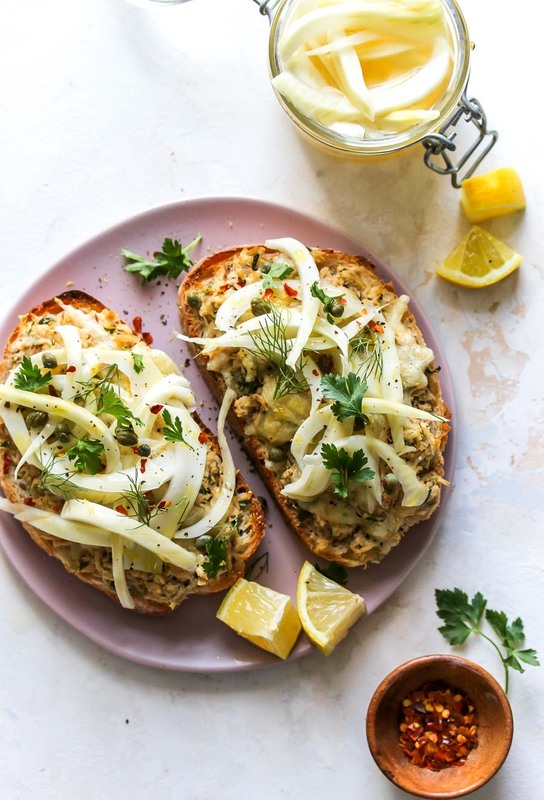 Tuna melts with quick-pickled fennel is an elevated version of the diner classic, bringing bright herbaceous flavors to the forefront. Enjoy as an easy, make-ahead lunch or weeknight dinner. Place fennel in large glass jar or measuring cup. Bring 1 cup water, vinegar, sugar, and 1 tsp. of the salt to a boil in a medium saucepan, whisking to dissolve sugar and salt. 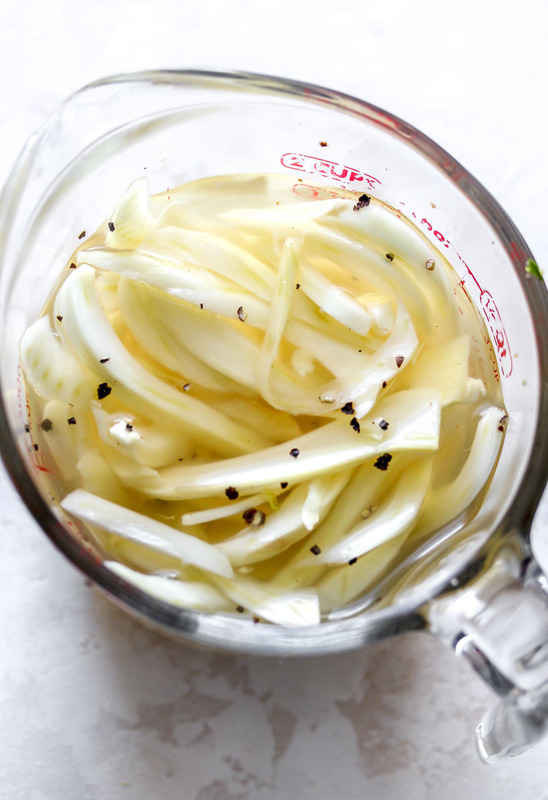 Pour liquid over fennel and set aside to cool to room temperature. Combine tuna, mayonnaise, mustard, lemon zest and juice, parsley, capers, remaining ½ tsp. salt, black pepper, and fennel fronds in a bowl; stir well. Spoon tuna mixture evenly onto bread slices. Top with grated cheese. Broil on HIGH 2 to 3 minutes, watching closely to not burn, until cheese is melted and crust is golden. 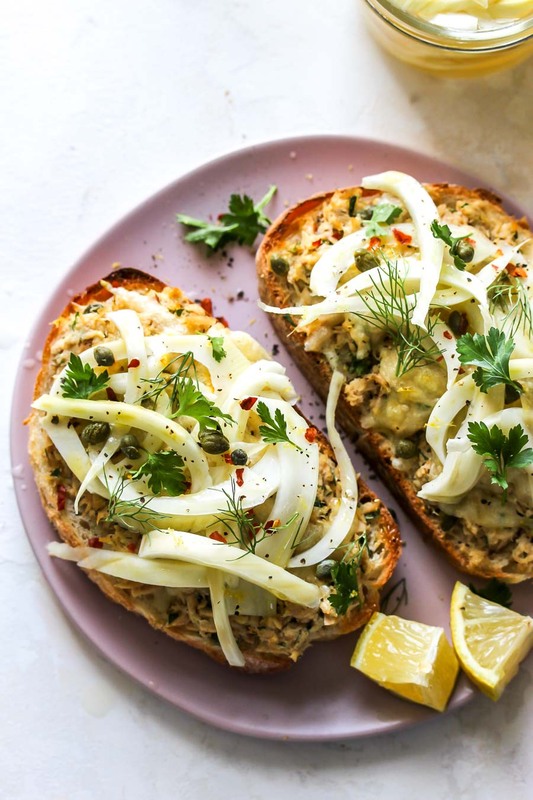 Top tuna melts evenly with pickled fennel. Garnish with additional fresh herbs, if desired.